If you are about to embark on a bathroom remodeling project, updating the flooring should definitely top the list of priorities. People often walk in the bathroom in bare feet, so the surfaces should be comfortable to the touch. They should also provide enough traction to keep from sliding after taking showers. Here are a few types of flooring to consider installing in home bathrooms. Due to its water- and stain-resistant properties, ceramic tile is a popular choice in residential bathrooms. Clay is fired in a kiln at high temperatures to create the hard, sturdy material. Available in a variety of colors and styles, ceramic tile can mimic the look of stone and hardwood to complement the aesthetic of your space. Porcelain is made with more refined clay and fired at higher temperatures to make it harder than ceramic tile. 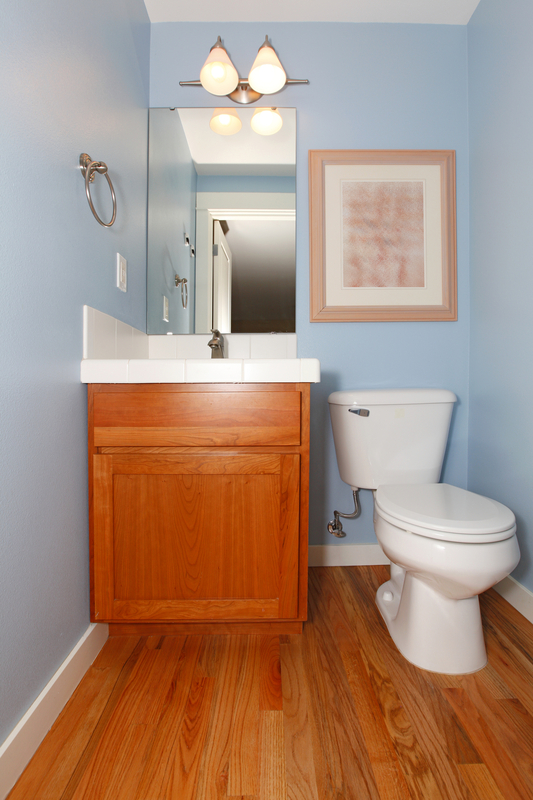 The flooring can withstand the impact of heavy loads, so consider placing it in bathrooms that get the most use. Although the surface is naturally water-resistant, applying a melted glaze membrane makes it completely impenetrable to liquids. If you want to bring texture and depth to the bathroom, consider upgrading to hardwood floors. Wood is naturally porous, so make sure to choose pre-finished flooring. Each side is sealed to prevent water from penetrating the wood and seeping down to the substrate. Moisture-barrier adhesives can also be applied during installation for an added layer of protection. Vinyl planks and sheet vinyl are water- and stain-resistant and can mimic the look of more expensive materials for a fraction of the price. This makes them popular options in kitchens and bathrooms in homes with rambunctious little ones and pets. Sheet vinyl comes in long rolls and is installed in one piece to avoid seams. Similar to laminate, vinyl planks are installed slat by slat to achieve the look of wooden panels. If you want to outfit home bathrooms with high-quality flooring materials, the associates at Thayer Decorating Center are eager to show you a world of possibilities. The store is known throughout Oregon County, MO, for its selection of floor products from top-of-the-line brands. The team will listen to your needs to determine what solution is best for your space and then provide fast, efficient flooring installation. To schedule a consultation, call (417) 264-7773, or visit them online to learn more about their services.